Eileen Chen is a Chinese American woman who specializes in folk religion. She teaches at a local college, but when the opportunity presents itself to do research on the nature of witchcraft and shamanism, she leaves her life behind and travels to the Canary Islands. Filled with a rich family history, Eileen has the gift of sight, passed down from her grandmother who made her living as a shaman. Written eloquently, Ms. Yip paints a fairytale picture of a land rich with magic and mystery as Chen finds herself embroiled in a mystery. Who is the enigmatic man who seems to have his designs set on her? Who are the witches that turn up in strange places with spells on their lips? What is this Witch’s Market? Sometimes the past doesn’t want to stay buried and as Eileen will learn, there are ruthless forces in place concerned with doing just that. This was an eloquently told tale, but at times the way Eileen and the other characters spoke seemed too stylized for real life. It fit with the fairy tale quality of the book, but I found myself getting irritated by the unreal speech or laughter. It reminded me of some of the dubbed martial arts movies that are so beautiful with the lush costumes but the speakers matched to the characters don’t do the story justice. Eileen was an interesting person. A professor researching folk religion who just happens to be a witch. As she learns more about the dual nature of shamanistic Chinese magic and Western witchcraft, she grows as a woman and in her powers of observation and sight. Overall, I enjoyed this book but wished the author had done more with dialog and making it as real as some of the inner lives of the characters they represented. 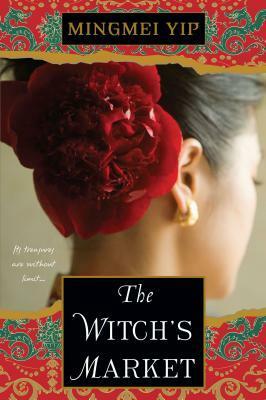 If you enjoyed books about Chinese history or even books about witchcraft, you may find this book intriguing. I did. The blend of Eastern and Western culture was one of its strongest points, combined with the lyrical quality to Yip’s words.